Are you accustomed to noise or do you need absolute silence? If you need background noise to get to sleep, a white noise machine or even a white noise app on your phone could be the solution. Apps tend to offer a range of noises from waterfalls to rain and fan noises, and can be set to play constantly or to switch off after a certain amount of time. If you need silence, consider whether a different bedroom in the house would be quieter if you have the choice of rooms, or experiment with earplugs. Invest in blackout curtains or blinds (you can buy blackout fabric which clips to the back of your existing curtains) if streetlight glow is affecting the quality of your sleep. Assess your room and landing for LED lights and charge your phone well away from your bedside overnight. The bedroom can become dumping grounds for the household as it’s one of the rooms that guests are less likely to see! Stick to the mantra, ‘tidy home, tidy mind’ and invest some time in making your sleep space an orderly and altogether more calming one. This is especially important if your bedroom doubles up as a home-office. Is it time for a new mattress? Are you sleeping on a hand-me down? Mattresses are supposed to last eight years before they need replacing and sleeping on one that’s past its prime could be causing all manner of aches, pains and sleep issues. Likewise, investing in really nice bed linen can make a world of difference to how relaxed you feel when you slip between the sheets. Look for 100% cotton and a high thread count. If you can’t stretch to bed linen, upgrade your pyjamas! Are you waking up a little chilly or tossing the covers off in a sweat every night? Negotiate with your bed-fellow if you share a bed, and work out whether there’s a better temperature for your bedroom. This may involve some thermostat adjustments, a change to your bedding, or even moving the bed away from or closer to windows or radiators. Where was the nicest bed or bedroom you ever slept in? This is your benchmark. 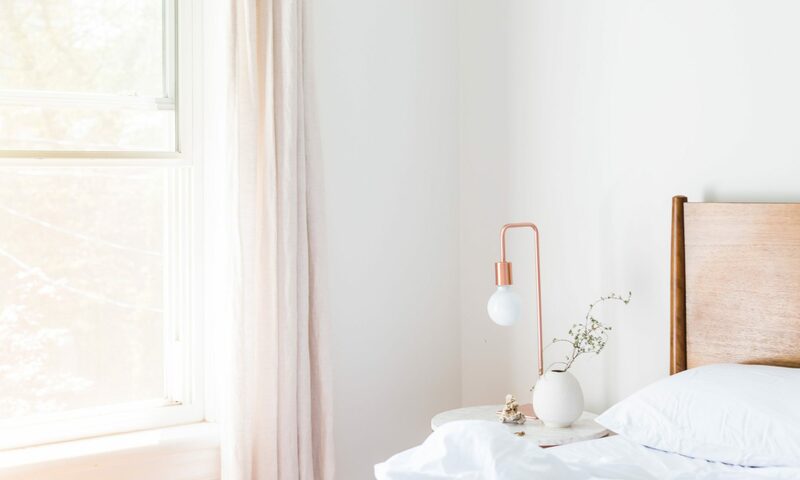 You may not have the budget to purchase a four-poster bed, floor-to-ceiling curtains or piles of Egyptian cotton linen, but the chances are you can make a few changes to your bedroom to help bring about more soothing, sleep-promoting associations.